The Annual Presidents’ Forum and Lohei Lunch held on 16 February 2019, saw 32 member organisations come together to toss the Yu Sheng and shout out auspicious phrases. During her welcome address, Dr June Goh highlighted SCWO’s plans for 2019 which included the Singapore Women’s Hall of Fame exhibition from Oct to Dec 2019, Star Shelter’s participation in the Global Network of Women’s Shelters Conference and the Women’s Register’s reconceptualization. Dr June touched on our proposals for ACWO presidency such as the Inspiring Girls programme and the ASEAN Women’s Hall of Fame. 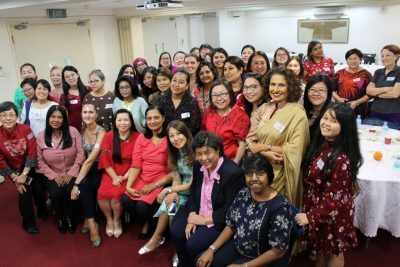 She also welcomed the two new members – Singapore GLOBALWOMEN (Globalfoundries) and International Women’s Federation of Commerce and Industry (IWFCI Singapore). As is the agenda for the first President’s Forum in the new year, members were given the opportunity to share their plans for the year and their interest for collaboration. Members were enthusiastic and showed keen interest in collaborating with each other. We hope the year of the Pig brings everyone 年年有余 “Nian Nian You Yu” – abundance ‘excess’ through the new year opportunities to enlarge our horizons, good health and happiness!